Is the syntax, host then : then port. A new bugfix version of SIMH has been released! I’ll be adding more binaries onto the sourceforge page, but in the meantime, the sourcecode is up, win32 binaries & i386 linux binaries are also uploaded. Author neozeedPosted on February 17, 2009 Categories SIMHLeave a comment on SIMH v3.8-1 released! Once more again, special thanks to Rick for making this whole “adventure adventure” possible!! While adding pages & stuff to http://gunkies.org/wiki/Unix_System_6 I came across this thing called xv6 at MIT. What it is, is a port of Unix v6 to the x86 cpu. Before this, apparently they were using actual v6 on a PDP-11 emulator, however for their uses it would be easier to use something more i386 like. Now the cool part is that it’s SMALL. It harkens back to the day when people could actually read the code to their OS.. Yes, that all there is to it! It litteraly takes 4.5 seconds to compile the whole thing, and setup a boot/root disk image on a 1.5 Ghz P4. The only ‘catch’ is that you need elf tools to build the thing.. Most Linux/NetBSD/OpenBSD folk ought to be in luck as they have been elf for quite some time now.. For windows people it’s just easier to install an OS into a VM that contains an ELF toolchain.. Don’t feel bad about compiling it in a VM as it will not be that big of an ordeal. If you feel brave go thru the labs.. They have stuff to add like virtual memory and whatnot, but they do walk you thru it, with guides and stuff… Remember this is out of a class, they don’t throw the kids to the wolves as it were. Naturally since it’s v6, there is no TCP/IP, heck it doesn’t even have native tools… But it *can* run exe’s so it’s got enough to get your feet wet.. It’s dammed near tempting to complete the course work to flesh it out, grab 32v and start building a userland then bring it to 3BSD levels… But then I guess that is missing the point of a small readable Unix. Anyways I found it interesting, no pictures on this one but either way its… different. Oh and the disk images run great under Qemu for what it’s worth. Wow I’m surprised a few hours googleing about and I got it running…. 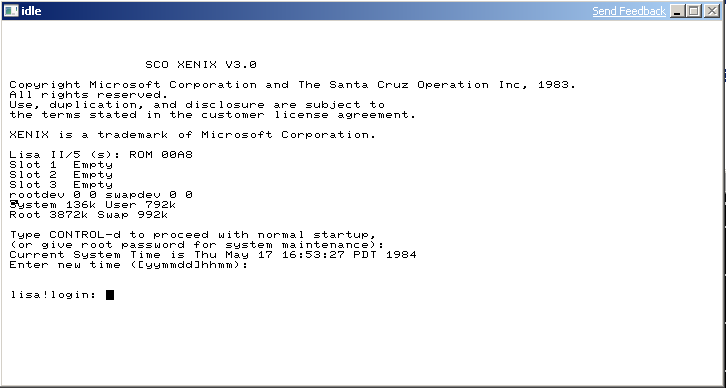 http://sourceforge.net/projects/idle-lisa-emu ), which can infact run Xenix! It also says it can run the uniplus SYSV (so says the readme)..
Then firing up idle, setting the CPU to max speed, and booting up whenver I was going to answer a question I toggled it back to 5Mhz.. otherwise it would take FOREVER to boot… lol like the ‘good old days’. Once the boot floppy had formatted the 5mb hard disk image, and transfered on reboot I had to tell the bootloader to boot from the profile disk..
Namely these two for Apple Lisa Xenix..
It’s amazing that lisa emulators were sort of capable of running Lisa Office System, now they can run the old unix stuff… it’s still impressive. Ive been testing this build now for over two hours with Quasijarus & the microvax… All seems well. The new build of SIMH with SLiRP adds some performance improvements, along with the older more compatable idle code. I’ve included the source with this build so I don’t lose it again… I can’t say just how difficult it was to piece this together again from my notes, and sadly it should have been way easier. The vax/vax780/pdp11/pdp10 are already prebuilt for windows users, and I built them with MinGW… YMMV as they say. that way it’ll run faster, and take up far less cpu when idle… Right now my Quasijarus is using 5% of my laptop idling with 1 connected user. It’s a wiki dedicated to retro-computing, but more so in first person.. Not so much in the factual history of wikipedia. Anyways I thought it was worth mentioning, and I’ve started to redo some of my work here over there. Hopefully this will get more people interested in the whole thing. I’ve also been thinking about doing a windows installer for the z80 CP/M module from SIMH.. Hopefully the games & stuff work fine, so it’ll be FUN!